You See What We See. Learn more about your eye health with an Optomap ultra-widefield retinal photography eye exam by Stonewire Optometry in Edmonton's Kingsway Mall. 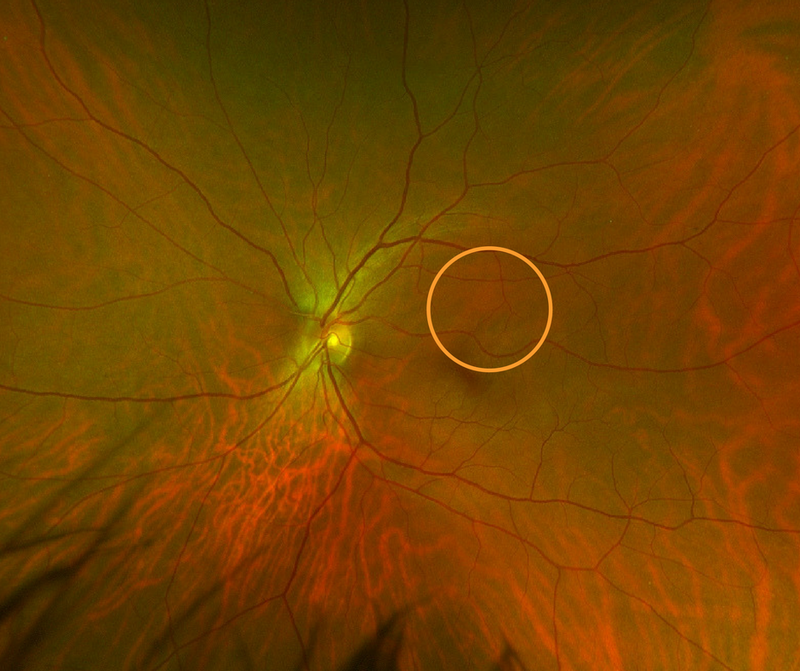 Eyemagination video explaining the optos ultra-widefield retinal imaging experience. Optomap ultra-widefield photograhy is an exciting imaging technology that allows both you and your optometrists to see a 200-degree picture of the inside of your eye or about 80% of the retina. This ultra-widefield image provides a ‘map’ which helps to guide our eye doctor during the eye exam towards areas of concern. "We introduced Optomap imaging technology into Stonewire because we found it helped provide our patients with peace of mind, knowing that their eyes were healthy. While clinically it serves as a great education tool and an improved way to monitor areas of concern" Dr. Ross McKenzie, OD. Stonewire uses the California AF Optomap model which images the eye faster than previous generations, allowing younger and older patients to be imaged in just seconds. The California is the first Optomap to incorporate both composite colour and autofluorescence imaging. You can see an example below of the difference in the images. The autofluorescence image provides us with another tool in trying to determine the cause of underlying vision complaints. It can help our eye doctors uncover problems that would previously gone undiagnosed or explained. Composite colour imaging uses multiple lasers to image the back of the eye. These lasers penetrate the layers of the retina to different depths, allowing your optometrist to visualize and located the layers of the retina more easily. This aids in the detection, diagnosing and monitoring of various eye conditions. The Green (532nm) visualizes the sensory retina to the RPE layer. The Red (635nm) looks deeper between the RPE to choroid. When combined, they produce the image you see above, which can be used to help your optometrist explain your eye health. The auto-fluorescence (AF) mode on the Optos California model helps our optometrists monitor retinal conditions by showing abnormalities or metabolic changes within the retina that may not be visible during standard digital retinal photography or in a dilated retinal exam. This test is valuable in patients with conditions such as diabetic retinopathy, age-related macular degeneration or hydroxychloroquine toxicity because it can help determine if the affected area is in an active or stable phase. This non-invasive test can regularly be performed on patients of all ages. but they do not replace a dilated retinal exam. Although the optomap California provides our optometrists with an ultra-widefield view of your retina, it does not replace the need for a regular dilated retinal exam. Patients with conditions such as diabetes, hypertension, glaucoma, age-related macular degeneration still require this procedure on an annual basis, as it's still considered the standard of care. A dilated exam provides more detail to your optometrist by understanding elevations and depressions, clarity of the eye, and a more dynamic view of the retina. Optomap ultra-widefield images are simply a tool used by our optometrists to help uncover and monitor eye diseases during a routine eye exam. The test is especially useful in patients who are asymptomatic, or who may not be receiving regular dilated retinal exams. They also provide a digital record which we can use to monitor eye conditions year to year. These Ultra-widefield images also provide an excellent way to educate our patients on their eye conditions or to ensure them that their eyes are healthy. Should something be detected during an optomap exam, your optometrist will need to perform further testing. Testing may included visual field analysis, OCT retinal imaging, ultra-widefield autofluorescence photography, or digital retinal photography of the central retinal pole. *Images may not be captured on all patients because of pupil size or mobility issues. Is Optomap Imaging safe for children? Yes. Optomap images are safe to take on children. Eye disease can affect children just like it affects adults. Quality routine eye care can provide peace of mind, and help parents better understand their child's eye health. How new is Optomap technology? Optomap has been around since 1999 and is currently being used in about 8700 optometry and ophthalmology offices around the world. Is optomap as comprehensive as the old way I had my eye examined? Optomap is additive to your eye exam. It gives both you and your eye doctor and view that was previous unavailable. It adds to you doctor's ability to diagnose the health of your eye, and it better allows you to understand what is happening. Imaging also allows us to better monitor your eye health for changes, good or bad.